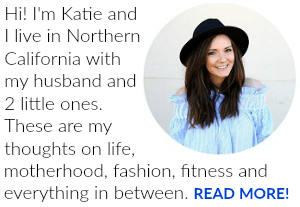 Last Updated: August 1, 2018 By Katie 6 Comments -- Paid Promotion. Disclosure policy here. 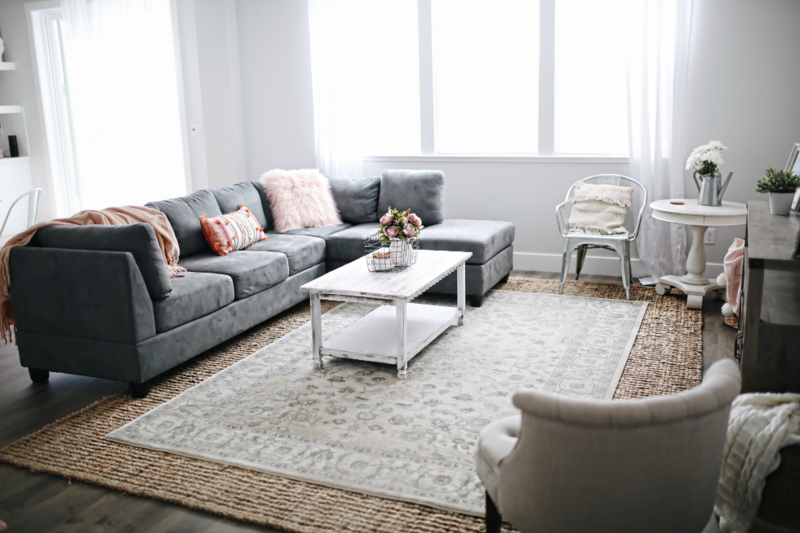 Moving on with our New Home Tour Series, it’s time to share our living room! 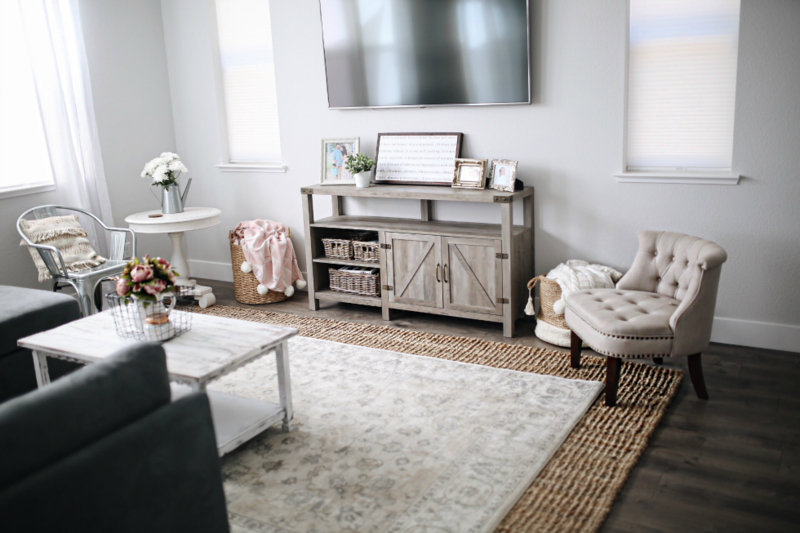 I’m so excited to share that we partnered with Overstock to design our room to my vision exactly! 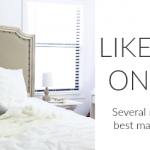 Overstock has an amazing selection of everything you could possibly want and need for your home, from major furniture pieces to window coverings to rugs and decor, and everything in between! 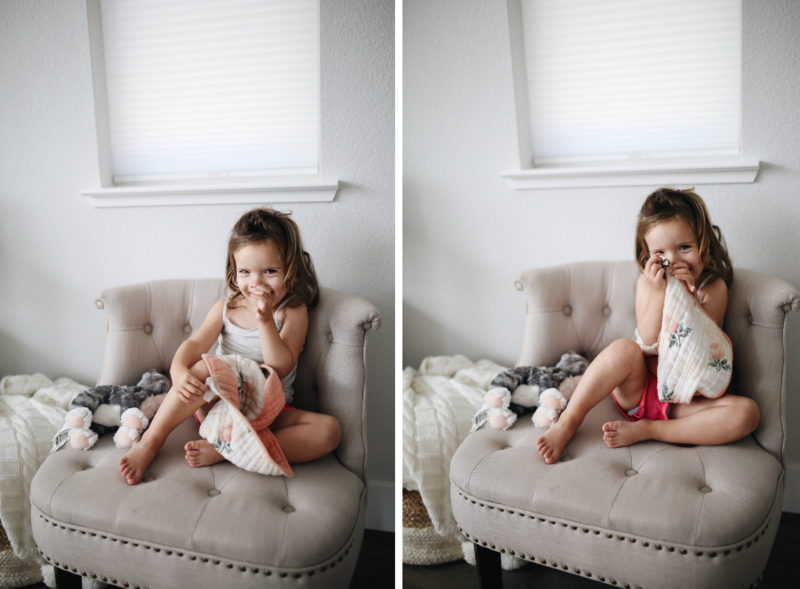 Working with them was nothing short of a dream, and I am SO excited to share our end result! 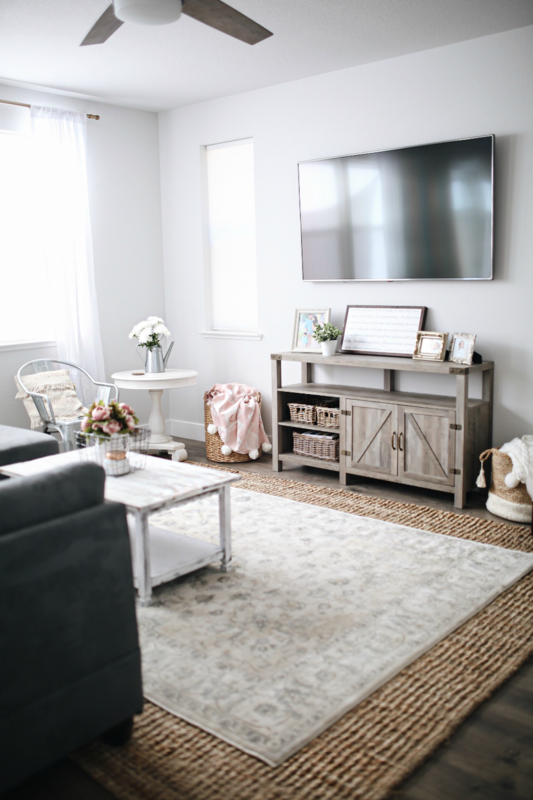 It was so fun picking out the core pieces and making our living room come to life! I wanted a cozy place where we could gather and enjoy each other for years to come- I think we’ve created exactly that. The couch was one of the toughest decisions for us- but we decided on this one and absolutely love it. 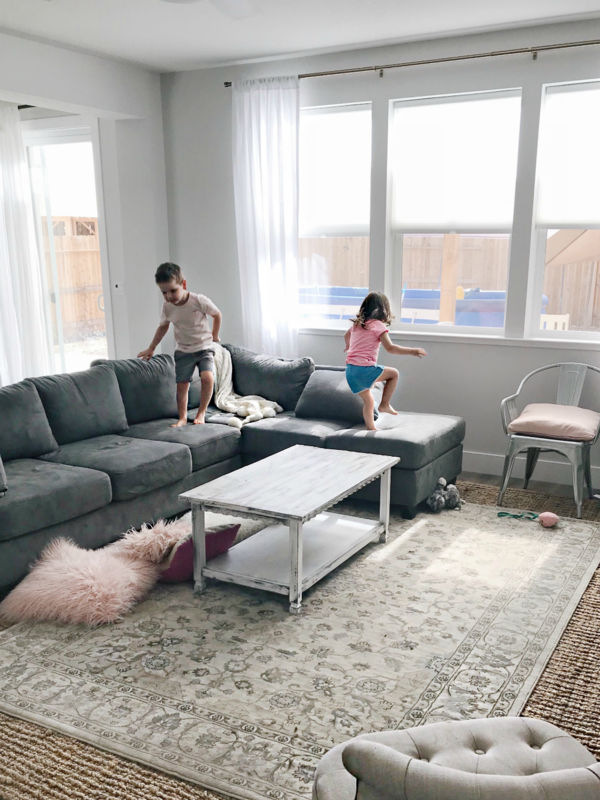 The sectional style and the dark grey color are both exactly what we had in mind- great for cozying up with the family and the color is perfect for kids! 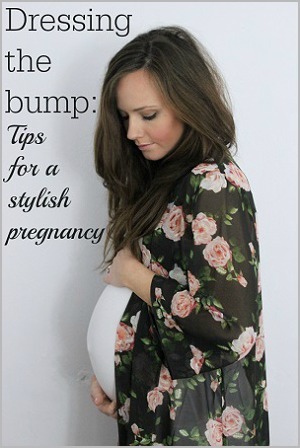 ;) It’s also durable and easy to clean- two musts! 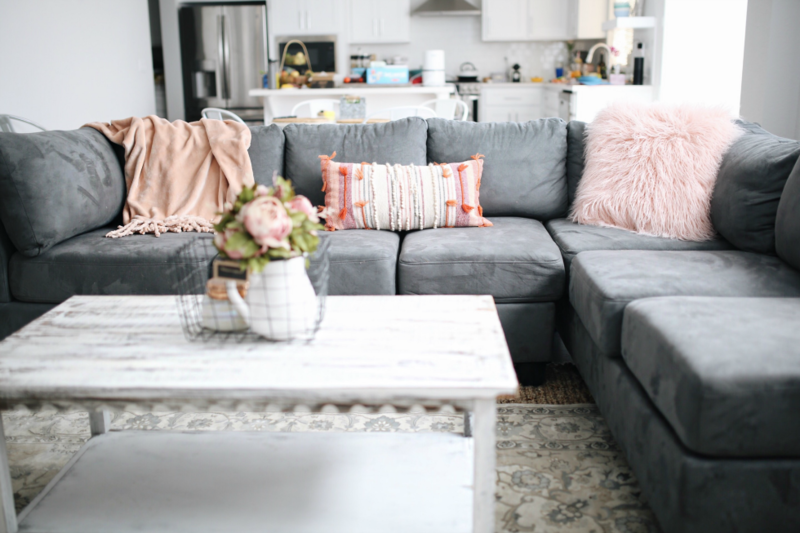 I went with lots of light colors to brighten up the dark couch, and couldn’t be happier with how it turned out! 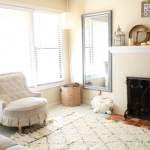 I love the layered rugs, to add some dimension and cozy up the jute rug (which I am obsessed with, by the way! I got the 9×12)! 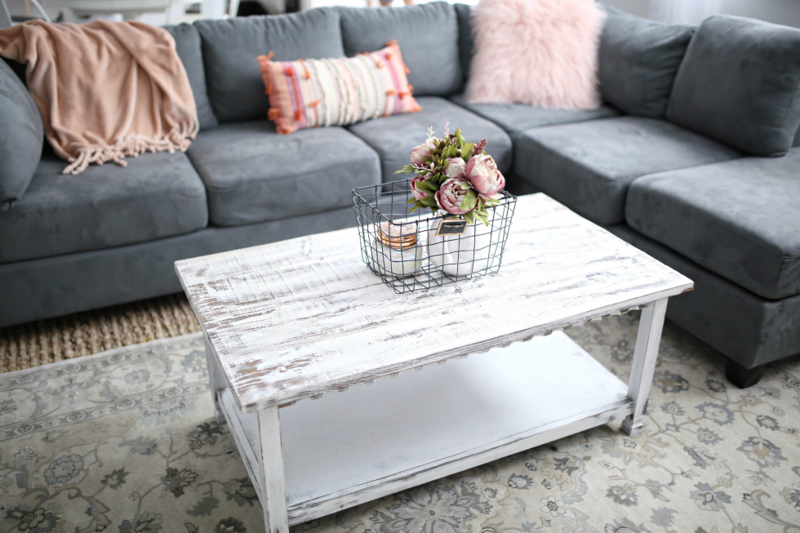 I also am absolutely in love with the vintage shabby chic feel of our coffee table- tres francais, and exactly my style. It’s sturdy too, and will definitely be used for years to come. 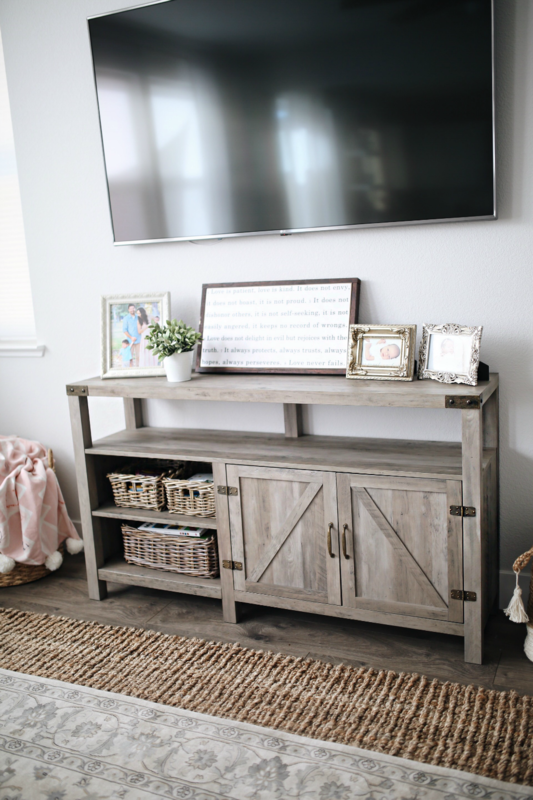 The tv stand (in “grey wash”) was a favorite choice, with the gorgeous grey wood color and sturdy construction. 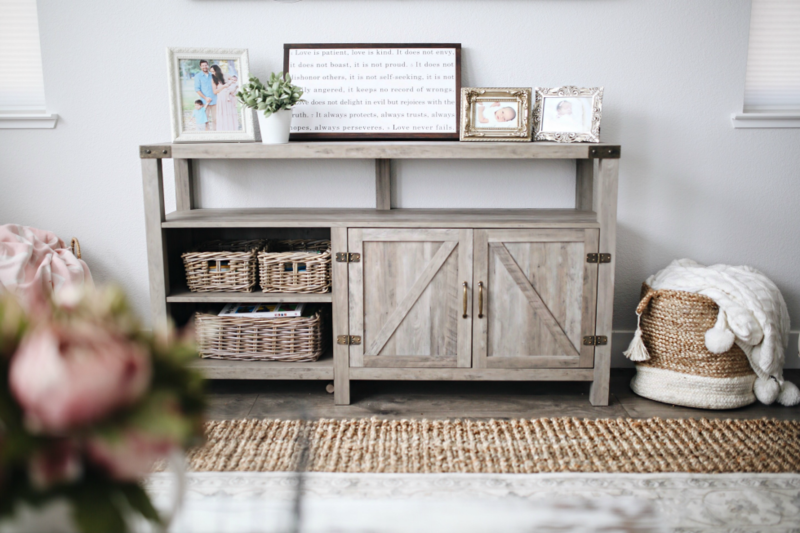 A perfect piece for adding our own special touches and also some hidden storage in those cabinets! The curtains were easy for me- I wanted white linen, and I loved how they went with our gold curtain rod. We went with these window coverings, for ease of use and also so that the rest of our decor could pop against them. 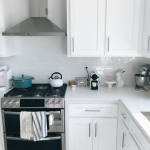 I love the white simplicity of them, and LOVE that they allow some light through (not blackout) while still being total privacy shades (you can’t see through them!). 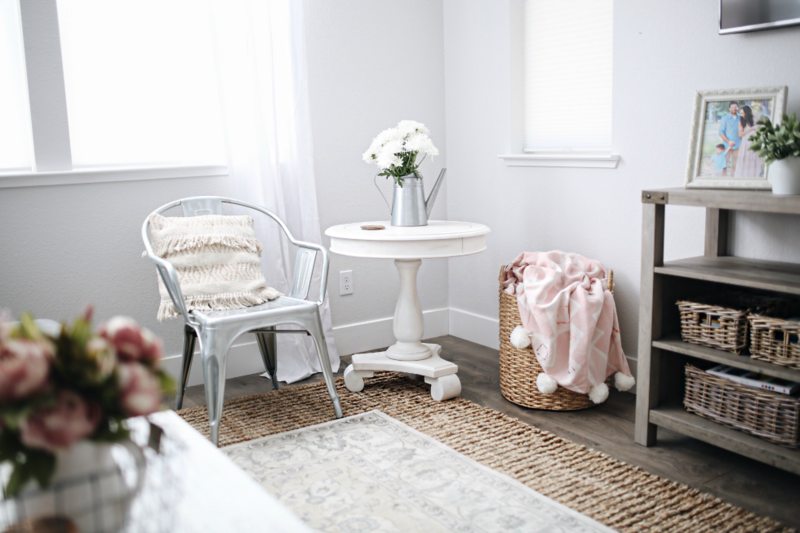 Add in the finishing accent touches of this tufted accent chair, gorgeous pedestal side table and cute little boho basket to hold all of my throws (and some toys too, of course) and the room is complete! Again, I’m just so so happy with the end results! Hope you love, too! 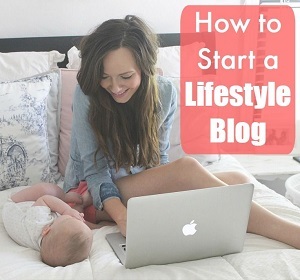 If you have any questions, let me know! 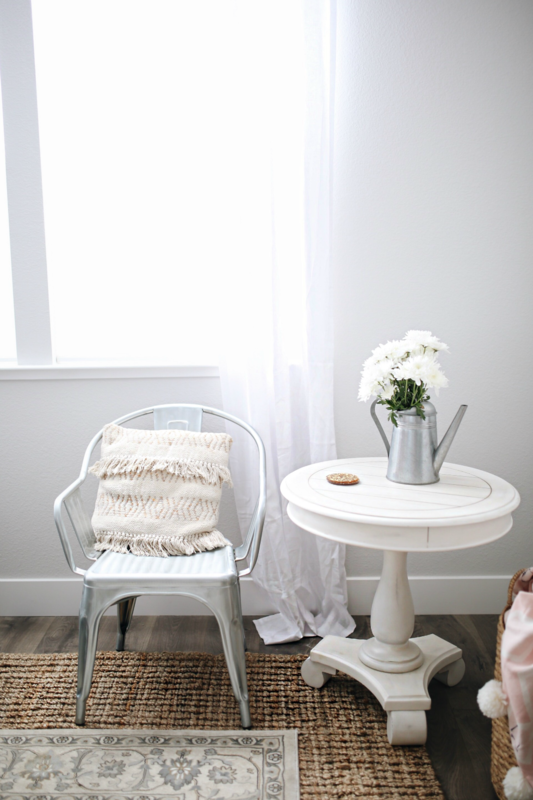 See our Dining Room tour here! What color did you chose for the tv stand? The whole room looks great! Thanks! 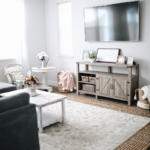 I want to recreate this whole room – Love Love Love it!